Cleaning your windows consumes a lot of time and energy? You can make a change now – just contact our representatives and request our window cleaning in Highgate. We will manage this matter for you and the results will be appropriate for every part of your windows – the glass, framework and sills. With our support, you will have the flexibility to do anything you desire with the time you normally spend for window washing. However, our services will bring you even more, as you can witness from our list of benefits. We also provide our professional services in nearby areas: Dartmouth Park, Hornsey Lane, Kenwood House, Belsize Park, Upper Holloway. 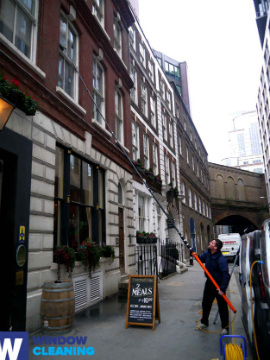 With our professionalism and technical expertise, you can depend on us for domestic and commercial window cleaning. Your home will look perfect after the service, regardless what kind of windows you have. We thoroughly wash small, French doors, sash or double windows, bay windows and patio doors. Furthermore, we clean garden windows, skylights and greenhouses. In other words, you can count on us for complete cleaning of your windows, including the framework and ledges. You will have perfectly looking workplace with the help of the specialists of commercial window cleaning. You can count on our first-rate services for all types of business premises. If you own a small shop, we can completely polish its windows by using our water fed extension pole equipment – it gives us the chance to as high as the fourth floor. If you seek pristine look for the glass panes of a skyscraper in London and the surrounding areas, we will make use of our rope access tools. In both cases, you will get superb results right away. The professionals of window cleaning use advanced strategies for the practice of scrubbing and rinsing your glass surfaces, roof windows and conservatories. Our water-fed extension pole method allows us to reach up to the fourth floor. The pole is connected to a water supply in the van, neutralising the danger of damage to the exterior of your property. We also use high pressure cleaning as part of our window cleaning procedure. You can also take advantage of these worthwhile procedures. Benefit from our domestic window cleaning in Highgate – we provide great services for your home on affordable prices. We use purified water to clean the windows thoroughly. We stay safely on the ground and clean with water-fed pole technology. Contact us now - call 020 3746 3113 or just fill in our booking form. Our staff will help you place an order and answer any questions. You will love the results of our household services, we assure you to that!